Today is traditionally Stir-up Sunday and I decided to make my first ever Christmas pudding using the Guinness Pudding recipe that appeared in last month GFM. The fruit had been soaking in the Guinness since Saturday lunchtime and was beautifully plump by the time it came to make the pudding this afternoon. I didn’t realise until I came to make the pudding that I didn’t have any muscovado sugar and had to replace it with a mix of soft dark brown sugar and demerera sugar. I also misinterpreted the recipe, it states “spoon in mixture into bowl and level the top”. I read this to mean fill the bowl right to the top and level it off. This misinterpretation produced startling results when the pudding began to rise and lifted the saucepan lid that it was steaming in. Serves me right for squeezing a 1.2 litre (2lb) pudding into a 1 litre pudding basin! However, now the pudding has cooled it has sunk back down to normal proportions. I did come across this crazy looking pudding basin and I’m very tempted to buy it for next year! 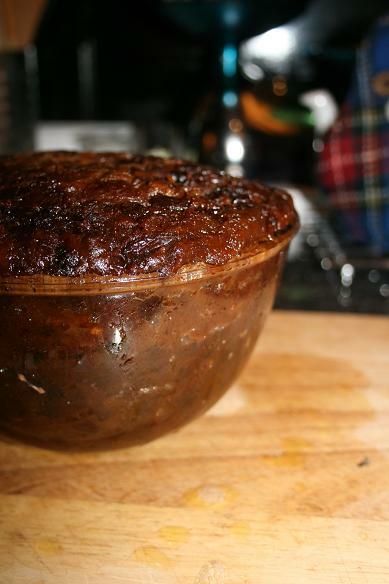 It looks and smells like a Christmas pudding so I couldn’t have gone too wrong! We’ll have to wait until Boxing Day to taste it. 1) In a large bowl soak the mixed fruit, dates, orange & lemon zest and apple in the guinness for 24-48 hours. 2) Butter a 2lb pudding tin then lightly coat the butter in 2tbsp of muscovado sugar by slowly tipping and turning the bowl. 4) Take a sheet or foil and greaseproof and make a pleat in the middle (this allows for the expanding pudding). Place over the top of the pudding bowl and fix in place with string. thanks for think to this on Twitter Jules..so what DID it turn out like? Compared to others you have made I mean? It’s delicious. I love Christmas Pudding and am very particular as to what makes a good pudding. You can really taste the Guinness & spices. If your not a fan of cloves reduce the cloves as they are quite dominant.